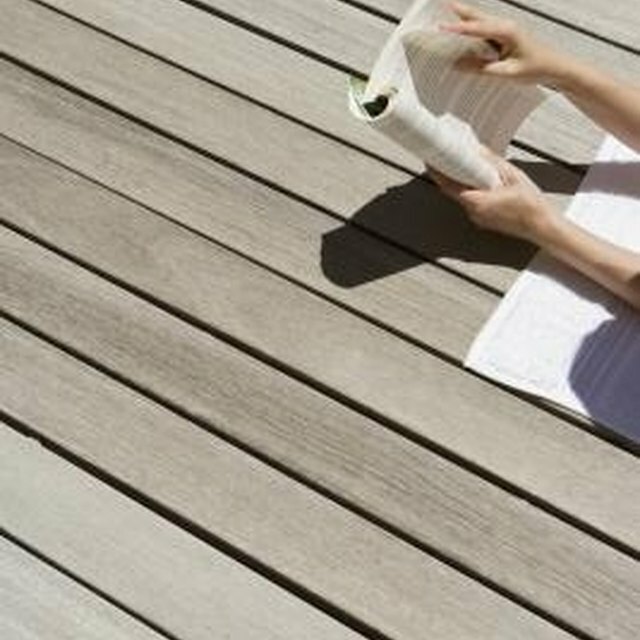 Trex Decking, made from recycled wood and plastic fibers, does not rot or warp nor does it require painting or staining. Its plastic materials protect it from moisture and insect damage. The wood materials help to protect it from UV damage. It will weather and fade since being in the outdoor elements exposes it to sunlight and water, yet it achieves its weathered look within 12 to 16 weeks. Protect the decking with a few simple cleaning and maintenance techniques. Use a Trex composite decking for low maintenance. Spray the decking with a hose twice a year to remove general dirt build-up. Fill a bucket with warm, soapy water and use a bristle brush to scrub away tough dirty spots. Apply a deck brightener to remove tannins, the brown pigment stains caused when wood in deck releases its tannins upon getting wet. Clean the deck with a broom and hose before applying the brightener. Follow the instructions provided with the brightener, which can be purchased at home improvement stores. Remove snow with a plastic shovel. Apply rock salt to ice to melt it from the decking. Wipe up food spills with a clean, wet cloth. If a stain appears, spray the area with a hose. Fill a bucket with warm, soapy water and scrub the stain with a bristle brush soaked in the water and soap. Spray the decking with a hose to remove mold and mildew caused by debris. Fill a bucket with warm, soapy water and scrub the mold or mildew with a wet, soapy bristle brush until the stain disappears.